Bedroom furniture with shelving, desks and storage solutions, all designed to meet the requirements of modern life. Our wardrobes, cupboards, desks, dressing tables and units are all made-to-measure. As per our range of kitchens, bedroom units come in a variety of styles from modern shapes and clean lines, to classic forms with refined details. We've created perfect bedrooms for spaces such as basic four wall rooms to elaborate areas such as a loft conversion. 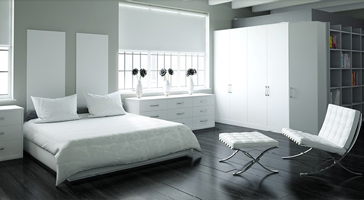 We provide multiple options, from a simple run of wardrobe doors to complex angled wardrobes. Our wardrobes utilise a customisable shelf and railing system making them perfect for adaptation to house clothes, shoes, boxes and even tie and trouser racks. Free standing drawer units and tables to entire fitted master suites and walk-in wardrobes; let us help you create a clutter free space utilising storeage solutions designed to make the most of the space you have. Add to this an impressive range of handles that allow for the incorporation of added charcter and individuality, resulting in the bedroom of your dreams.